If you like bold fashion tuxedo jacket that set you apart from boring dressed people, you need to try out Ferrecci brand tuxedo jackets. 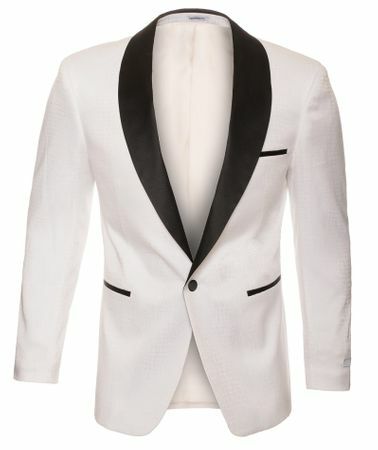 Ferrecci is all about tuxedo jackets for the red carpet with style and makes some of the most stylish fashion tuxedo jackets for men on the market. This white shiny snake pattern tuxedo jacket features a white shadow pattern woven fabric for a bold Italian look. Made of poly/rayon. Modern Fit.